Port Waratah Coal Services (PCWS) has had a record day for coal loading, with 495,000 tonnes loaded onto ships at Newcastle on Monday. PCWS boss Hennie du Plooy spoke at NSW Parliament House last night, telling Liberal Party coal supporters that the industry is running strong. "Despite challenges that the industry is going through, the coal chain in the Hunter Valley as a whole is running at a record rate for the month to date, well in excess of 180 million tonnes," he said. "While it's challenging, it's not all doom and gloom." 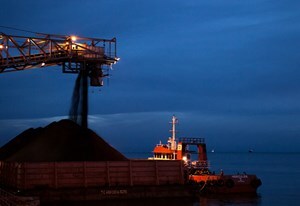 Du Plooy said coal was the second largest source of Australian exports, after the iron ore industry, and that Australia was the second largest exporter of coal in the world. At the Newcastle Business Club lunch on Tuesday du Plooy said Newcastle was likely to export about as much coal in 2015 as it did last year, while volumes from Indonesia had fallen by “about 20 per cent year on year”. Port of Newcastle executive manager of trade and business development Peter Francis said Newcastle had about 4500 ship movements in 2014, and modelling showed the existing channels could handle 10,000 movements a year, implying there was a potential for doubling of trade at the port. Of these movements, 1717 coal ships visited the Port of Newcastle in 2014. The coal export industry has also been booming in Queensland, with coal exports for the end of May reaching 200 million tonnes, while exports were expected to reach 220 million tonnes for the end of 2014-15.